All edibles (fruit trees, citrus trees, vegetable plants, tomato plants and herbs): 20% off. It is not too late to get another crop of your favorite edibles into the ground. Bromeliads: 20% off our exotic selection of unusual varieties. Now that our vegetable and flower gardens are in full growth we can sit back, admire all our work and listen to our green leaves make chlorophyll...or CAN WE??? What are these holes in the leaves? Something is eating our plants. If we don't do something will it eat everything? Here are a few of the most common "perps" responsible for eating holes in leaves: slugs, snails, earwigs, caterpillars, grasshoppers, and flea beetles. How can we tell what type of beast it is eating our leaves? Slugs and snails leave a slime trail so it is relatively easy to see if they are responsible. They like to hide in dark, damp corners during the day and come out at dusk to feed. The best organic way to get rid of snails is to catch them while feeding and hand pick them off your plants. Throw them into the road for the crows to feed on. Slugs are a bit more difficult because they are smaller and have no shell to grab on to. Place a wooden board in the garden and the slugs will congregate under it at night. In the morning be brave and cut them in half with your pruners, or squish them with your foot. Place saucers of beer level with the dirt and during the night they will fall into it and drown. Slugs and snails are attracted to the yeast in the beer. This method will also trap snails and bugs such as earwigs. If these methods are not to your taste you can step up your game and use slug and snail bait. Iron phosphate baits are a people and pet-safe alternative to the traditional slug pesticide, metaldehyde. The baits come in the form of pellets that can be spread on the soil in the garden. When slugs ingest iron phosphate it interferes with their metabolism, so they stop eating and starve to death within a few days. Because it poses no known risks to people or other animals, iron phosphate is safe to use in fruit and vegetable gardens and around children. We stock a people and pet safe slug and snail bait called Sluggo. The strongest slug and snail bait is called "That's It" and when you sprinkle this stuff around the infested area, that really is IT for slugs and snails, and any dogs, cats or other animals that might ingest it, so please use it with care. Caterpillars: These munchers come in all shapes and sizes and each species has its favorite types of plant to eat. Some caterpillars are very small - under half an inch long, and some are two inches long with horns! Some are brightly colored and some are hairy. All will metamorphose into moths or butterflies so if you like butterflies in your garden let the caterpillars eat your plants. Caterpillars are quite difficult to get rid of organically. The best way is to hand pick them off the plant, but many of them have very effective camouflage and are difficult to spot. If the infestation is heavy use an organic pest control spray such as "Dr. Earth Home & Garden Insect Spray" or "Green Light Lawn and Garden Spray with Spinosad". Earwigs: We have had a big problem with earwigs in the South Bay this year due to the rain. They make irregular sized holes in the leaves of many plants and as they do not leave a slime trail it is difficult to know if they are responsible.They particularly love artichokes, corn, heads of lettuce... anywhere they can wriggle into and hide while they munch. Get rid of them by rolling up or crumpling up a damp newspaper and putting it onto the soil at the base of the plant. In the morning place the newspaper in a zip-loc baggie and throw it away as it will be full of earwigs. Earwigs will also fall into the beer trap you set out for slugs and snails. Our community notice board is now up just inside our entry way. If you have any notices or information about community events please feel free to post a notice on the board. Deep Roots Staff will of course make sure that nothing offensive is posted. As part of our commitment to the community, we are in the process of setting up Deep Roots as a distribution center for the Community Supported Agriculture service. This service brings boxes of organic vegetables to the consumer on a regular basis directly from the farmer with no middle man. We receive the boxes here at Deep Roots Garden Center and you pick up your order from us at your convenience. We are open 7/7 from 9a.m. to 6 p.m. In order to begin this service we need to have at least 20 people sign up. The cost is $16.00 per box of vegetables. 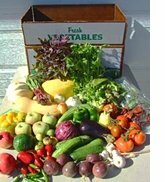 There is officially no commitment required but if after trying a box of veggies you can commit to one a week, one every two weeks or one a month it would benefit the farmer's cooperative www.scfcoop.southcentralfarmers.com which grows the vegetables and supplies the boxes. If you are interested in signing up for boxes of delicious organically grown vegetables please contact Barbara at DeepRootsNews@aol.com, or come in to the store and sign the registration sheet. Payment is in advance (we will let you know when the first payment is due) and delivery is every Wednesday. Please let us know AS SOON AS POSSIBLE if you are interested. We bring the Farmer's Market to YOU! Calling All South Bay Artists! 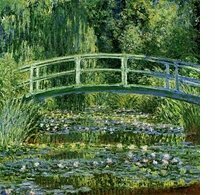 Deep Roots is looking for garden related art - paintings, drawings photography, ceramics, and original gift items of all kinds, to display and sell on a consignment basisat the Deep Roots Garden Center store at 207 N. Sepulveda Blvd., Manhattan Beach. If you are a local artist and wish to display your garden related work at our store please contact Barbara at DeepRootsNews@aol.com. This is a juried program with only the highest quality work accepted. We offer 10% store wide discounts to members of Heal the Bay, www.healthebay.org, Surfrider Foundation www.surfrider.org , South Bay Botanical Gardens, www.southbaybotanicgarden.org, Manhattan Beach Botanical Gardens www.manhattanbeachbotanicalgardens.org and Hermosa Beach Garden Club, (310) 372-5203. This offer does not include purchases in the flower shop, items already on sale, landscaping services, delivery or design fees. In order to obtain your discount please show your membership card. "An exceptional blend of good things from the earth and the sea", Fox Farm Ocean Forest Potting Soil is a powerful blend of all natural products including Pacific Northwest sea-going fish, crab meal and shrimp meal, as well as earthworm castings and bat guano Ocean Forest Potting Soil is nature's finest soil amendment. It is ideal for greenhouse applications, as well as indoor/outdoor plantings. Fox Farm has added composted forest humus and selected peat mosses to create the optimum organic medium for a versatile planting environment. With potting soil you really get what you pay for. Give your potted plants the best chance to thrive by planting them in a medium full of nourishment. Now is the time to add some fertilizer to your plants and flowers. Strong plant growth during the spring growing season has depleted the nutrients in the soil, and vegetable plants and fruit trees are concentrating on setting or ripening fruit. Potted plants need regular fertilizer to keep them healthy. Like a bird in a cage they need regular feeding as they cannot find their own nutrients through extensive root growth. Which fertilizer to use? That depends on which aspect of plant growth you wish to encourage. Fertilizer bags and boxes always have three numbers on them: 20-20-20, 30-10-10, 10-30-20, 5-7-3, and 10-5-7 and so on. The numbers stand for the percentage by weight of the three largest amount of elements or chemical compounds found in the fertilizer. The first number stands for Nitrogen. Nitrogen is important for making chlorophyll. This is the green pigment that plants use to make sugars. The second number stand for Phosphate. This is important for flower production. If the second number is high it should help the plant bloom. The third number stand for Potash or Potassium. This helps in root production. Many fertilizers are balanced or the numbers are equal. If the numbers are not balanced then the product has a purpose that is different than a general fertilizer. If you want a plant to grow foliage only then you would look for a fertilizer that is high in nitrogen. If you are trying to encourage flower production then you find a fertilizer that is high in the middle number of Phosphate. It is important to remember that fertilizer follows the law of diminishing returns. A little fertilizer helps greatly. More fertilizer will help slightly more. Too much fertilizer can kill the plant. There are even plants that want little or no fertilizer. 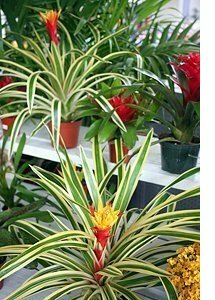 For example most of the bromeliads need very little fertilizer. We recommend the series of organic fertilizers by Dr. Earth. These products are made of all natural ingredients and contain beneficial soil microbes and mycorrihizae, and not only feed your plants but also improve your soil. If in doubt as to which Dr.Earth product to use ask us at Deep Roots Garden Center. NEW IN! 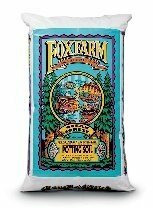 the Fox Farms collection of fertilizers for prize winner and/or valuable indoor or outdoor plants. Fox Farms fertilizers are ultra potent fast acting chelating fertilizers containing manganese, iron, zinc, bat guano, Norwegian kelp, and worm castings and are the best fertilizers on the market. Fox Farms fertilizers do not leave behind heavy mineral or salt deposits that lock up the roots like other high potent fertilizers do. Diluted with filtered water these are gourmet fertilizers for extra strong plants, bigger fruits and vegetables, and healthier soils. Expensive but good! Using these fertilizers in combination with Fox Farms soil will give you the healthiest plants possible.